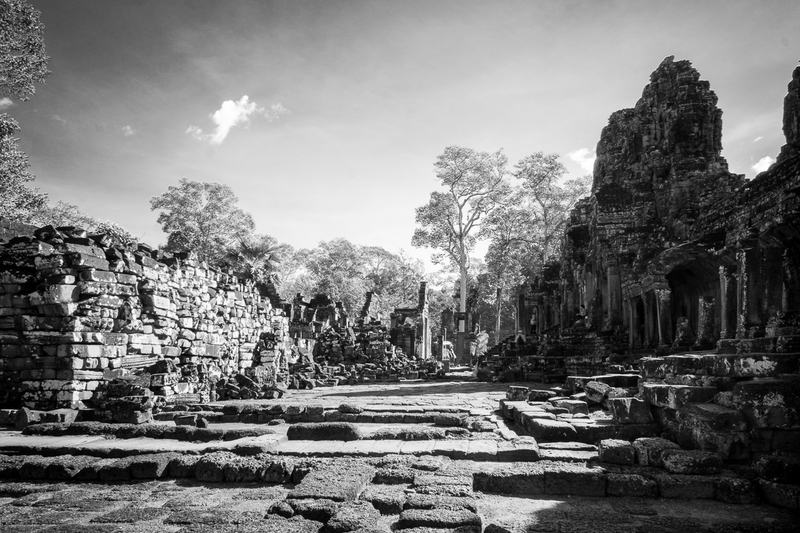 A shot from the inside of prasat bayon. Alex‘ used long exposures to get rid of all the tourists walking around. Alexander Waetzel, Sony a6000, Sony 2.8/16mm. We arrived in Siam Reap in the early afternoon and arranged a pick-up with our hotel by tuk-tuk. This seems to be the only way to move around town as a tourist and the streets are packed with these sometimes ridiculously decorated carriages pulled by what seems to be too weak and far too old motor scooters. Whatever, we made it to our hotel save but a little thrilled. Luckily the drive already gave us a little glimpse of what to expect from the coming days. Our hotel was neatly set in between little alleyways which made it perfectly quite yet central. The staff was super nice and the room clean and air conditioned. If you ever need a good and affordable place to sleep in Siam Reap make sure to pay these guys a visit. Daily scene in the alley where our hotel was located. The monks giving blessings to the locals in return for food. We met with our tuk-tuk driver later that day to talk about the routes we are going to take through the ancient city of angkor. We found that really nice guy Mr. Jaja (www.jayatuktuksiemreap.pfweb.eu) on the internet and he was eager to take us where we wanted to go. 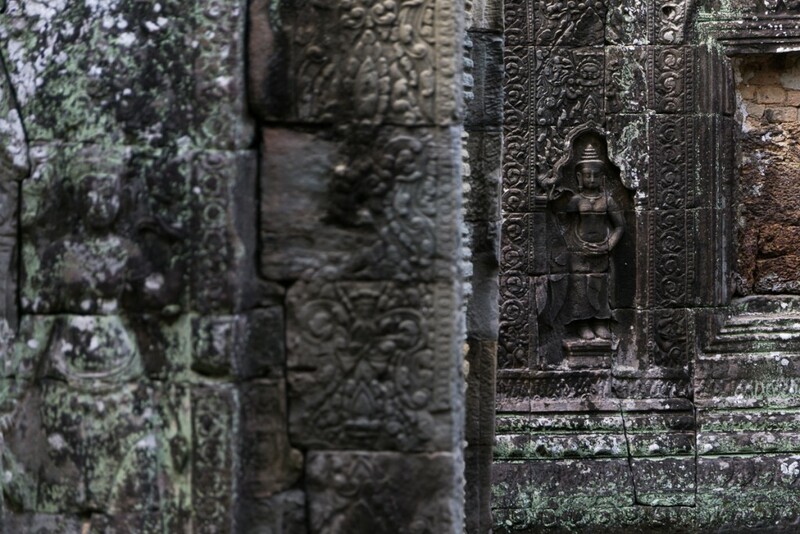 One think you should know is that the Angkor Wat experience is very much organized. There are tours everyone will do at the exact same time so you should really insist on telling your driver where you want to go otherwise all the places will be super crowded. Transport level cambodian. Alexander Waetzel, Sony a6000, Sony Zeiss 1.8/24mm. 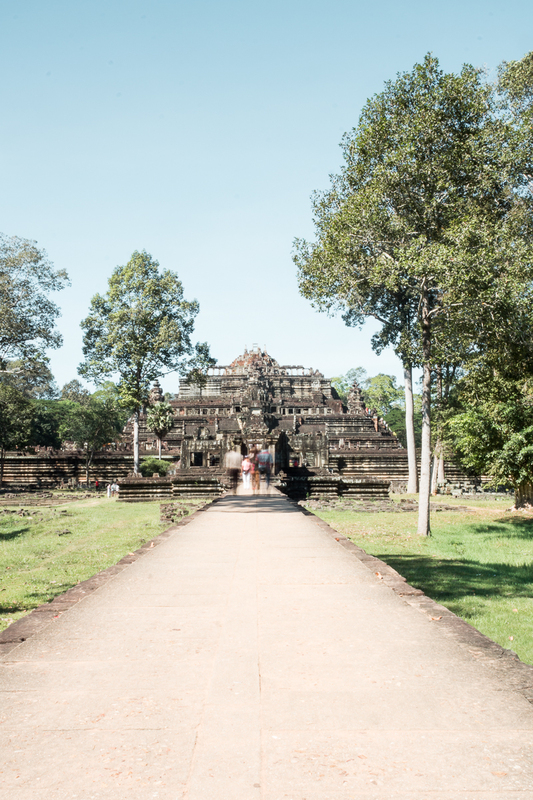 The next day we started with leaving the most famous temples of all, angkor wat to the side to see the others first to avoid the biggest crowd. The old city actually consists of quite a lot of different parts and ruins and there is definitely quite much to see. To see all of them you have to buy a pass provided at the entrance and it will cost you 40$ for 3 days. There is no way of entering without this pass so be super careful not to loose it! Also you should keep in my mind to bring enough water und some suncream, our days in cambodia have been incredibly hot. The first thing we went to see this day was the south gate of some very big temple-complex where we spent the next hours. One thing you definitly have to remember, don’t forget the look of your driver’s tuktuk. Mr. Jaja let us explore the temple site on our own and telling us he will wait on one specific point, the problem was every other driver in the area was waiting at the exact same point so it was quite hard to find Mr. Jaja again. 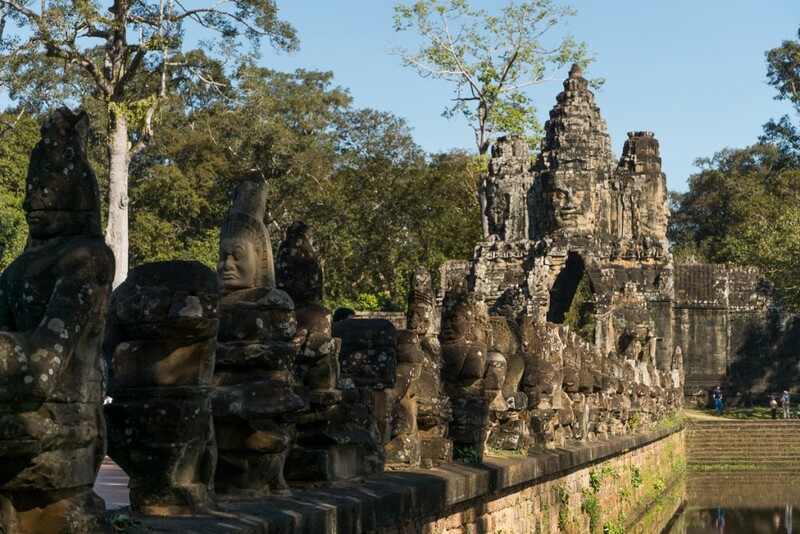 One of the big gates leading to the biggest of the angkor temple sites. Marie Baersch, Sony a6000, ZeissTouit 2.8/50mm. 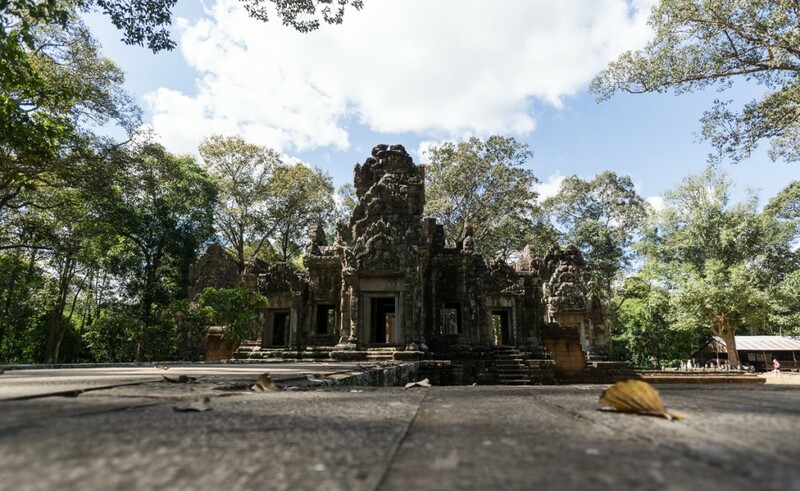 On of the first temples after the gate. It is well maintained and you can climb to the top to have a great look around. Alexander Waetzel, Sony a6000, 2.8/16mm. 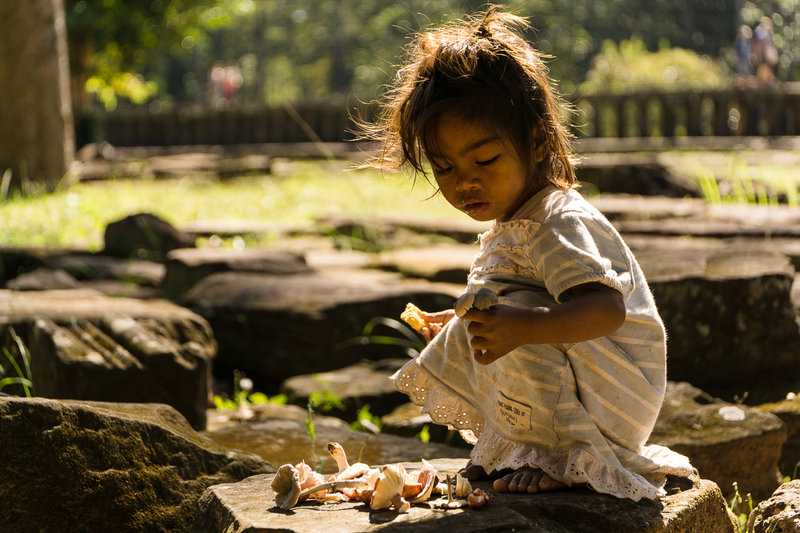 Throughout the temples you can find a lot of unattended children. a glimpse of how that place must have looked like back in the day. Marie Baersch, Sony a6000, Zeiss Touit 2.8/12mm. Inside the temples you can find some pretty impressive carvings right in the stone. Marie Baersch, Sony a6000, Zeiss Touit 2.8/50mm. We got back to our hotel in the late afternoon and after spending all the day between beautiful ruins we definitely had been in the need for a break. If you’re into it, SiamReap has a lot to offer after your recreation time. 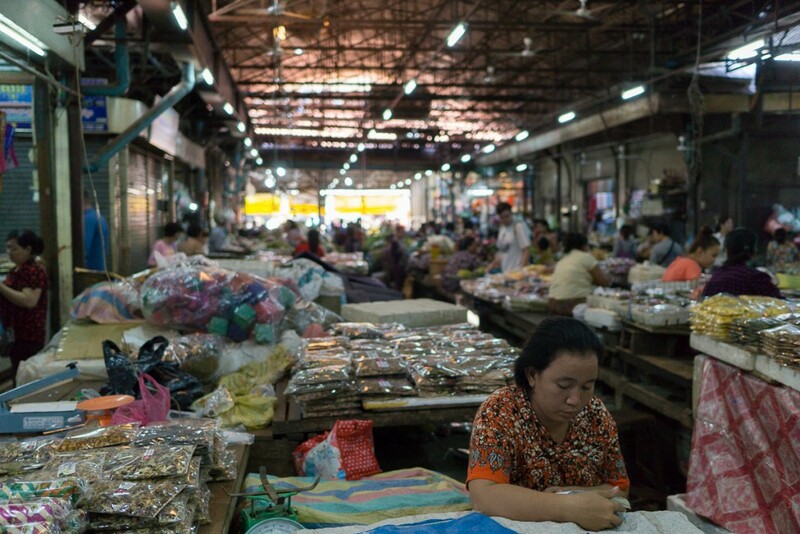 You got a lot of stalls and small markets selling you all kinds of stuff. 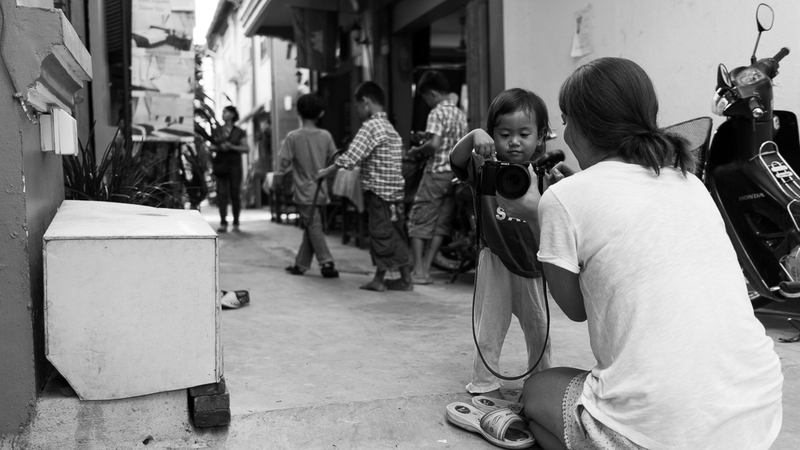 In addition you get some very unique oppurtinities to document local street life. the night markets are also pretty nice selling arts and crafts you cannot find between the usual scarf, tiger palm and tourist presents. Locals providing with everything you could probably think of right on the street. Alexander Waetzel, Sony a6000, Sony Zeiss 1.8/24mm. One of the bigger markets right in the center of siam reap. You literally can get anything in there from scarfs to fish for tonights dinner. Mr. Jaja told us that we could visit world famous AngkorWat at sun rise. So we thought we should definitely give it a try even though we would have to get up at 4:30am. We arrived at the entrance of Angkor Wat in pitch black darkness and had to cross a bridge over the surrounding water basin. Luckily there have been enough other tourists who did not forget to bring a flashlight to not fall of the bridge immediately. After we made it save through the outer wall you can see the 3 main towers of the famous site being faintly backlit by the days first light. Even though it is nice to see that place is so damn crowded even that early. You can’t take a single photo without a selfiestick or a group of other people in your frame. Getting quite frustrated about that we left Angkor Wat even before sunset and well, that was the best decision we made that day. With every other tourist in the complex watching sunrise at Angkor Wat we got the other sites almost completely for ourselves giving us the opportunity to explore the temples in silence and a very peaceful mood. 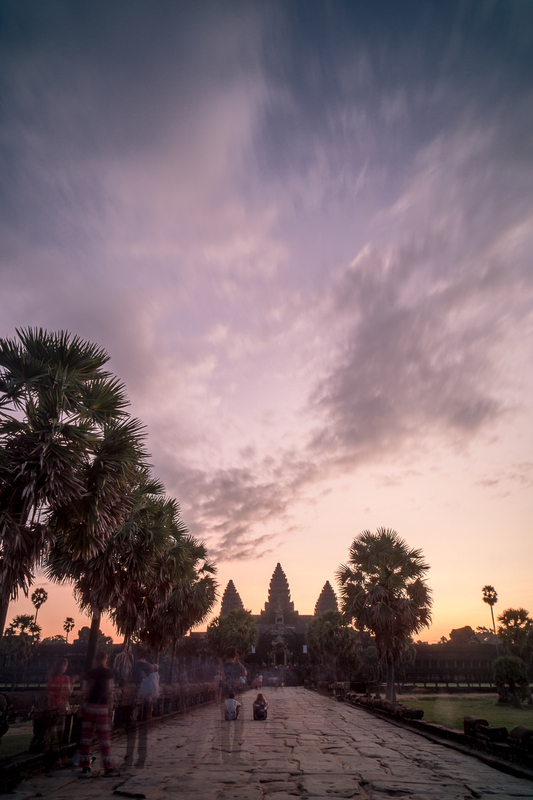 Sunrise behind Angkor Wat, with tourist ghosts all over the place! 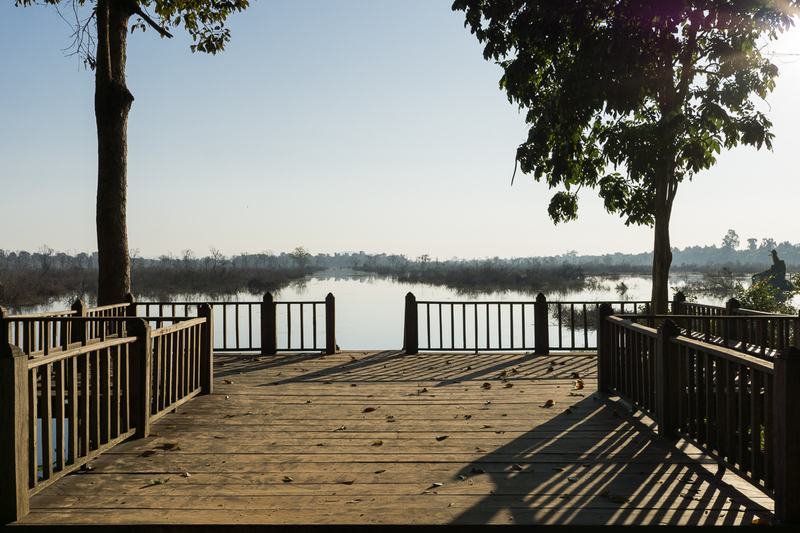 A small lake right behind of one of the smaller temples, giving you a great view around in sunrise. Little cambodian girl seems to know how to pose. The low sun making it awesome to take some very moody pictures from the temples itself. Alexander Waetzel, Sony a6000, Zeiss Touit 2.8/12mm. After a little nap at the hotel we spent some time again wandering around our neighborhood. There are a few places where you can find some very good coffee for example the Sister Srey Cafe which is run by 2 australien sisters on a mission to sell extremely good coffee and helping local students. The next day we made a little road trip with Mr. Jaja. He took us to a temple site and a waterfall about 60km from SiamReap. 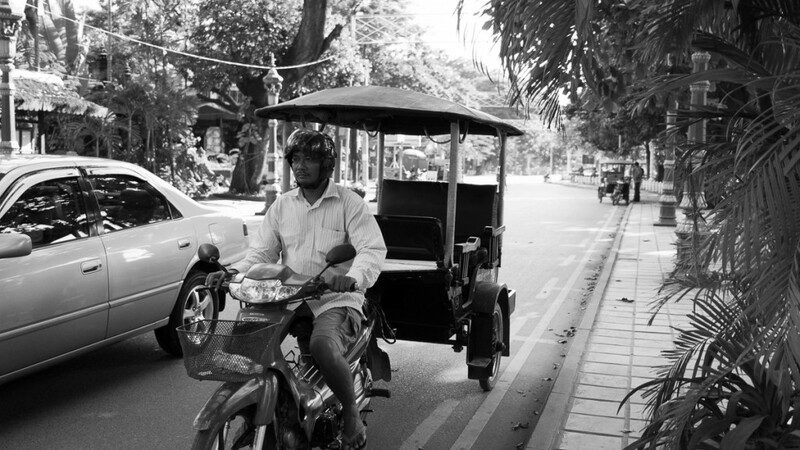 It was an insanely nice trip via tuktuk giving you the chance to stop anywhere and meet the real cambodian people. We did that for example at a local food market and we have been the only foreign people in the place. And still everybody was treating us with a smile and let us take a picture here and there. Further down the road, when we arrived at the waterfall we actually had to take a 1.5km hike straight through the jungle which was quite a thrill if you know a little bit about south asia wildlife. But it was a nice place to see and it takes you out of town for half a day. 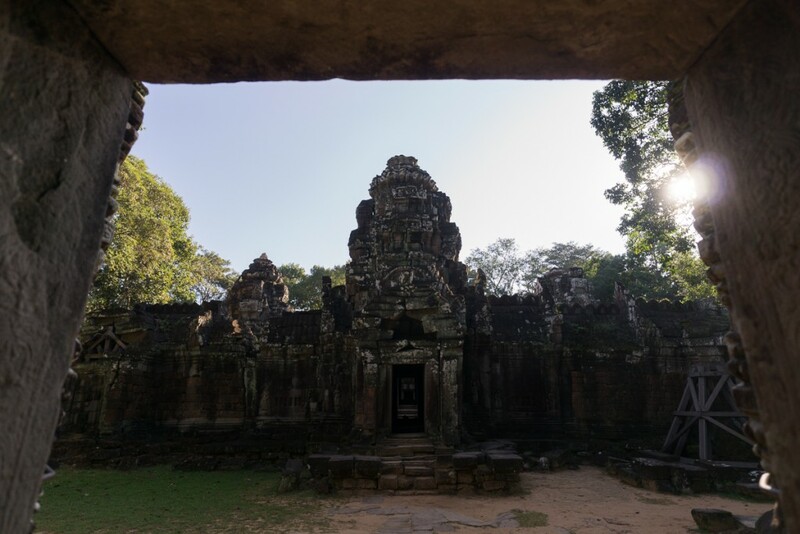 Mr. Jaja was also kind enough to drive back to siam reap through angkor itself so we have been able to see some of the temples again that have been to crowded the days before. Marie teaching some kids how to take pictures. 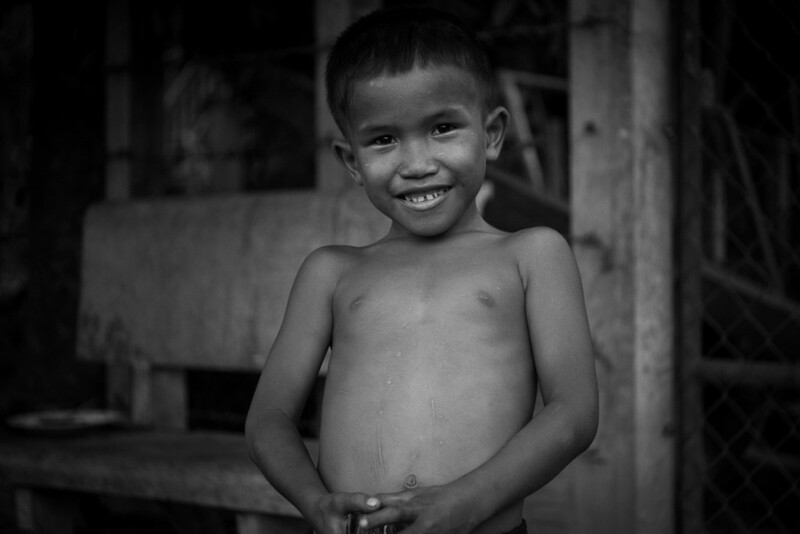 Nearly all the kids we encountered in cambodia smile at you, despite their daily circumstances. 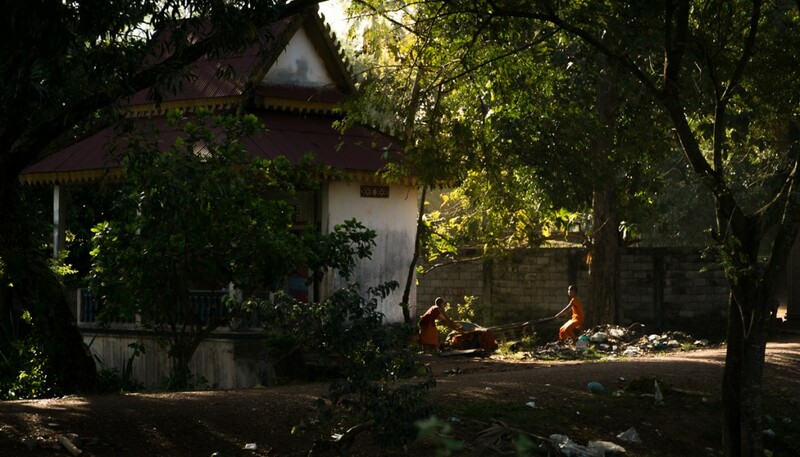 Monks doing their daily routine at a small monestary. Marie Bearsch, Sony a6000, Zeiss Touit 2.8/50mm. 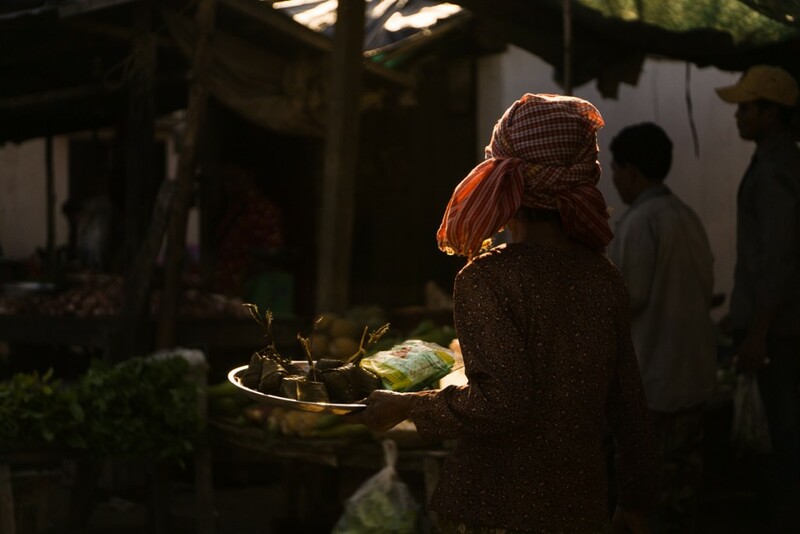 An old woman at a local food market. Marie taking her look around a local market. On this one we have been the only tourists around. 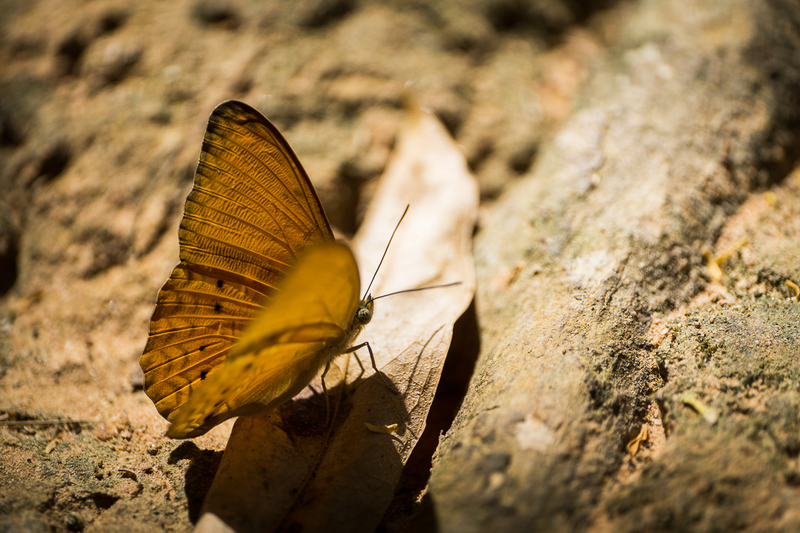 A butterfly we walked by on our jungle hike. 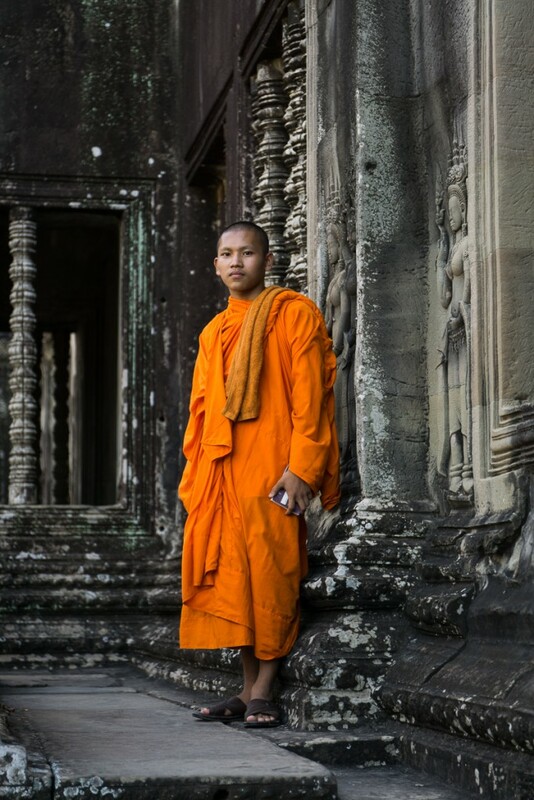 In the afternoon we stopped at angkor wat to take a look inside. Marie took this portrait of one of the monks she found inside. Marie Baersch. Sony a6000, Zeiss Touit 2.8/50mm. 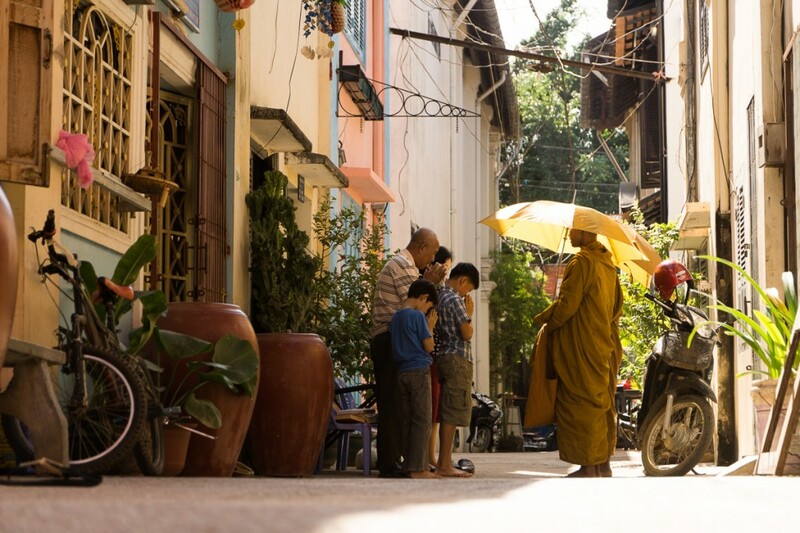 We spent our last day in Siam Reap with exploring the city a little further. 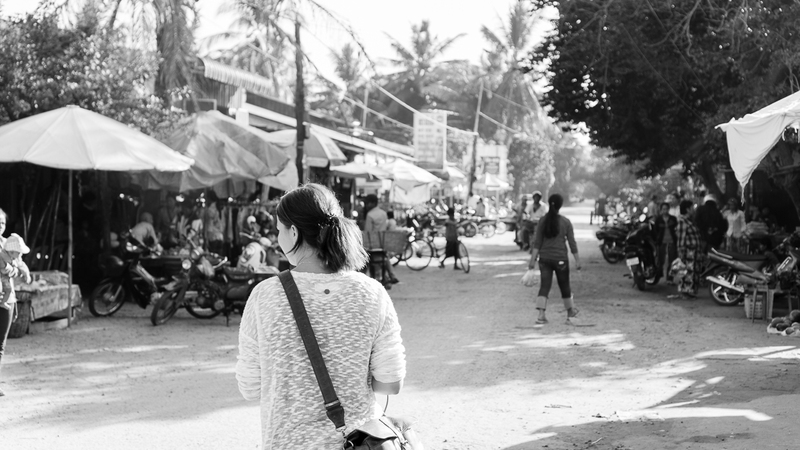 We took a walk through the outskirts of Siam Reap to see the places not so highly frequented by tourists. 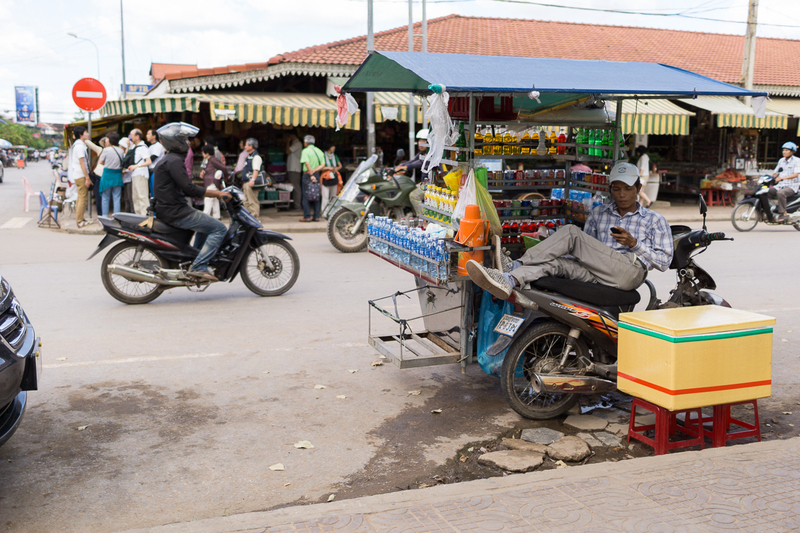 In the afternoon we rented some bikes and that really opened up a whole different world of cambodia to us. 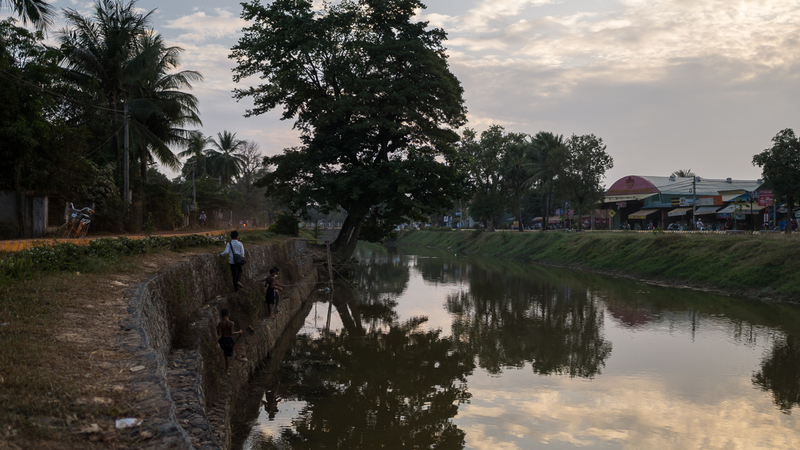 We found that street covered with red sand right next to a small river where the local people are doing their daily evening routine. It was pretty nice again to see the real cambodia and how these people spent their days if they’re not driving a tuktuk or selling stuff at tourist markets. 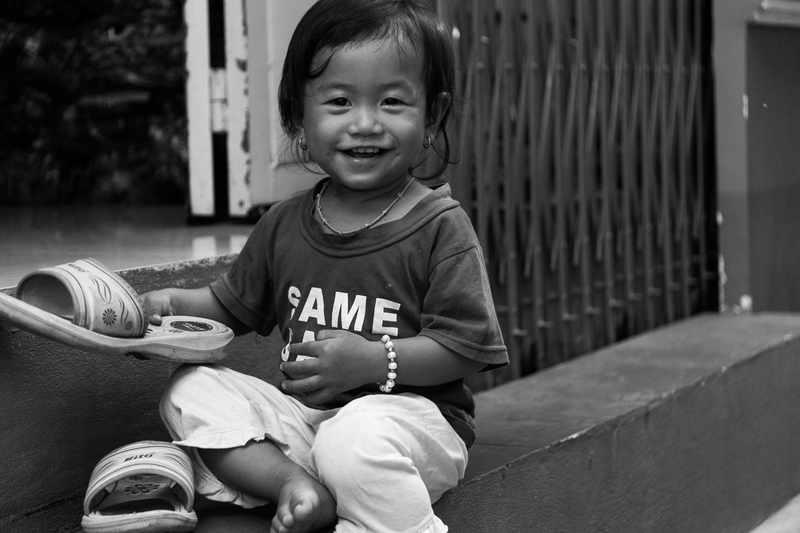 All in all cambodia has been a great experience. The ruins being there for hundreds of years really giving you a perspective of time and the people have been super nice throughout our stay. On the other hand you sometimes get the impression SiamReap was founded to host every tourist coming to see the temples making it quite touristy with all the connected annoyances. But even though that can be quite nerv wrecking it is definitely well worth a visit if you’re in thailand or somewhere close in south-east asia. Kids trying to catch some fish for tonight’s dinner. 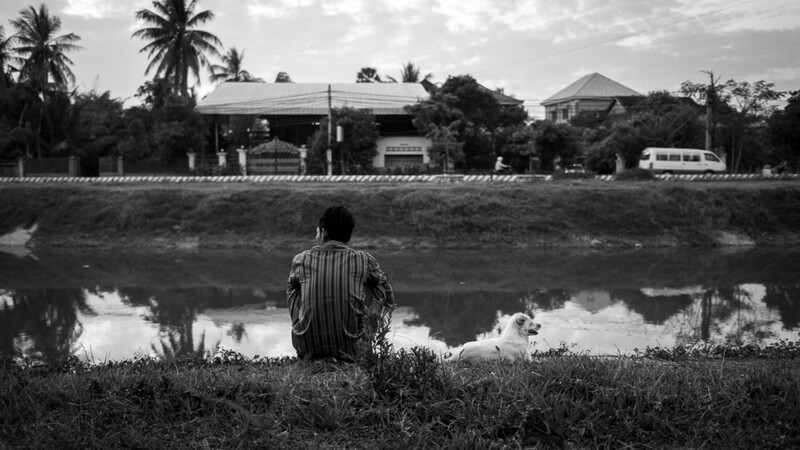 A man enjoying his early evening rest with a dog giving him some company. A small boy’s portrait Marie has taken on that sandy road we discovered on our bike tour. Marie showing the kids the pictures she took of them.